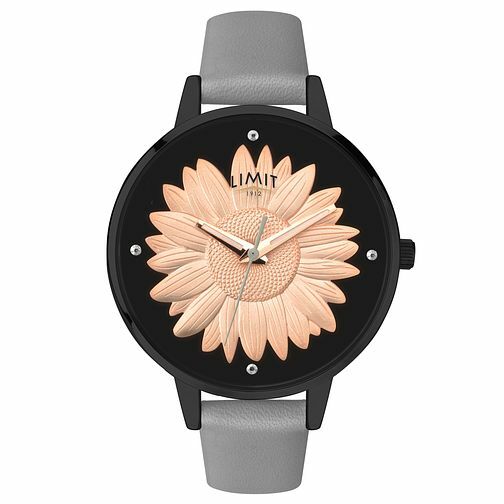 Limit's latest range of ladies' watches, The Secret Garden collection, is inspired by the typical British garden. Using the latest technologies Limit have brought to life a collection of beautiful butterfly, floral and sunflower designs in a vast number of distinct colours and styles. Limit are working with 'Butterfly Conservation' which supports the awareness of butterflies and the action taken to ensure the survival of this beautiful species. This watch has a round black case with a matt black dial. Clear stones mark the hours and a 3D sunflower sits at the centre of the dial.